This article by Margaret Kimberley is re-posted from Black Agenda Report. Ever since Israel was founded in 1947, Americans have been fed a steady diet of propaganda which tells us that we have no better friend in the world than the zionist state. As always in foreign policy issues, it isn’t clear how “we,” that is to say the average citizen, is ever better off because of machinations emanating from Washington. The truth is exactly the opposite. The average American is worse off, much worse off because of Israel’s role as the undeclared 51st American state. In every presidential election Americans who can’t support the two major party candidates are advised to get with the program and choose “the lesser of two evils.” There is no lesser evil in American politics, not when this country has doomed itself and its people by supporting nations like Israel which use state sponsored terror against millions of human beings in order to get what they want. Israel is once again killing people in Gaza, a reported 139 so far and most of these victims are women and children. Of course this carnage is carried out with impunity, because Israel knows that the United States will support whatever actions it takes, no matter how awful they are. While the world community may rail at Israel when it kills people in Gaza, or Lebanon or wherever else it may choose, the U.S. uses its United Nations security council veto power to keep that body from taking even the most cosmetic and useless action. In the eyes of the rest of the world, the American people become complicit in Israel’s crimes. The reward for the countless humiliations is more disrespect. America’s “friend” Prime Minister Benjamin Netanyahu quite openly supported the presidential candidacy of Mitt Romney. There was not even a pretense of diplomatic niceties or respect for the country without whom Israel wouldn’t exist. Romney traveled to Israel with one of his chief fund raisers, casino magnate Sheldon Adelson, to recieve Netanyahu‘s blessing. Adelson spent nearly $50 million in support of Republican candidates across the country and Romney was only the most visible. As always, rich Americans use their influence to insure that no one gets any ideas about straying outside the sanctioned lines of discourse. The openly evil Netanyahu does not suffer subtlety gladly. 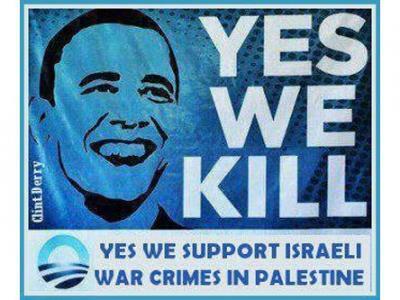 Despite Obama’s constant support of Israel, he cannot get any love back from the Israelis. So Netanyahu used the aftermath of an American election to make his point that he will do whatever he wants. He wins even if he seems to lose. Israel also has an upcoming election to be held in January 2013. Israeli elections are very dangerous for neighboring people, who bear the brunt of that nation’s viciousness whenever it is time for the Israeli public to be appeased and comforted by the sight of dead Arabs. Barack Obama has a different problem. He must appear at least somewhat diffident about slaughtering people and give the impression of being a peace maker reluctant to do battle. Of course Israel makes his efforts all the more difficult by killing people in earnest when the president traveled to Myanmar. Despite his peace prize laureate photo ops, he was forced to back Israel in its terror directed at Gaza. “There is no country on earth that would tolerate missiles raining down on its citizens from outside its borders,“ said the man who routinely sends drones to Somalia, Pakistan, and Afghanistan to carry out his kill list orders. It isn’t clear at all how Obama or any other American president can be thought of as the lesser of two evils when he publicly gives the go ahead for slaughter. No matter how reluctant American presidents seem to be in endorsing periodic Israeli killing sprees, Israel would not be able to act without American arms and money. The carnage, the broken bodies, and the dead children can all be laid at America’s door. The United States is the world’s only super power and the perpetrator of this crime is America’s friend. Perhaps there will be no more silly questions about why “they” hate us. It isn’t because they don’t want democracy or hate our way of life. They hate us because we keep killing their people. “They” don’t see anything lesser about our evil.